These Models are Popular in the Korean Market, however Other Models & Types are also available. If you are interested in the Korean products, We will arrange you to outsource the proper ones. This Materials are designed for Covering the Trapezoidal Connection Parts to prvenet them from any rain and wind leakage. It’s Demsinstion and shape can be customized. This Materials are designed for Draining the rest of Rain on Roof into Target Points. This Materials are designed for Closing the End of Roof Panel for preventing any wind and dust from Coming into Roof Panels themselves. These Models are Metalworked by the Korean Steel and Guaranteed Reinforcing Chemicals. 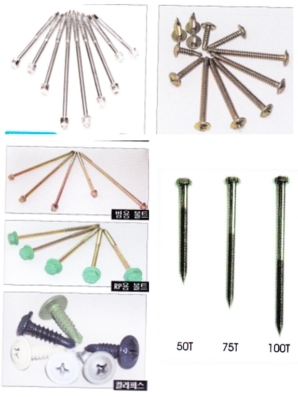 If you are interested in these Korean Bolts, we will arrange you to outsource the Proper Ones. We, TradeBelt will let you find the necessary materials from the Korean Market by our knowledge and Relationship with Manufacturing Factories.